In heavy clay and bricks industry, reduction of fuel consumption is the absolute priority of refractory linings. Special materials are used which aim at the reduction of firing circles with exceptional results in saving energy. Depending on the operating conditions, individualized solutions are proposed with advantages like low weight and big thermal output in combination with high tolerances in all temperature range and thermal shock resistance. 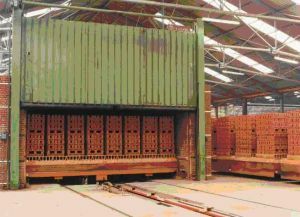 Prefabricated solutions are also available for kilns of each type and kiln cars of all sizes.